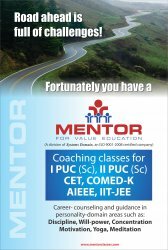 Additional Information for MENTOR coaching center in Marthahalli Bangalore. To equip our students with the right skill sets to bring about a transformation in their analytical, critical and logical thinking. MENTOR is an autonomous private coaching and tutorial centre that prepares and counsels academically qualified students to pursue right careers in the field of Science, Medicine and Engineering. MENTOR students have achieved remarkable results year after year including top ranks in NEET/CETRank No. 1 and Rank No. 2 in Medical and Engineering NEET/CET respectively. january 10th 2014 at marathahalli center.